Ich is a highly contagious parasitic infestation caused by the protozoan Ichthyophthirius Multifillis and its saltwater counterpart Cryptocaryon Irritans. The parasite burrows itself under the fish’s skin in order to feed and grow, causing skin irritations and osmoregulatory disturbances that allow secondary bacteria and/or fungi to enter the skin. It is notable that Ich alone is not fatal. Fatalities occur mainly through secondary infections. In advanced cases, the parasite will attach to the gills, causing an interference with the oxygen carrying cells, thus depleting the supply oxygen. Symptoms of Ich include the well know ‘salt grain like’ white spots (Ich is often referred to as “white spot” disease). As the infection spreads other common symptoms are rubbing against decorations, breathing difficulties, loss of appetite and increased mucus layer (washed off slime coat), cloudy eyes, frayed fins, and abnormal swimming behavior. Ich has to be present in the aquarium to cause an infestation. Frequently cited temperature fluctuations are not responsible; neither are other stress causing conditions alone or in combination. The Ich parasite can be introduced by new arrivals of fish, or be dormant in the aquarium itself. Healthy fish can live with a balanced host–parasite relationship for a long time. The healthier the fish the more difficult it becomes for the parasite to re-produce, which in turn keeps their population under control. New arrivals with a weak and unprepared immune system are extremely susceptible for the parasite and are ideal victims for parasitic infection. The unexpected appearance of Ich without new arrivals is usually caused by deteriorating water parameters which weaken the fish’s immune system. 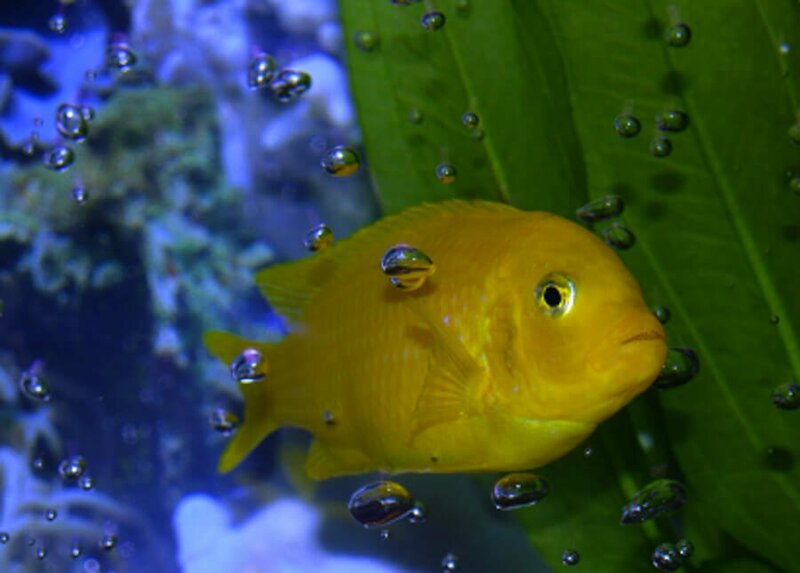 Excess waste, nitrates, fluctuating pH, ammonia, low dissolved oxygen content and other stress causing factors will lower the fish’s’ immune system and may lead to an outbreak which could have been avoided by good aquarium maintenance. Nevertheless the parasite has to be present in order for the disease to break out. The life cycle of Ich includes 3 stages. The mature parasite (trophozoites) forms pustules in the skin in order to feed (visible as white spots). Once the pustule ruptures, the trophont settles at the bottom of the tank. Secreting a coating it forms a protective capsule (cyst). Within, the parasite performs a series of cell divisions creating hundreds of new cells (tomites) which are released and search for a new host. There are about 300 tomites leaving the cyst. Tomites have to find a host within 3 days or they will die off. The complete parasitic life cycle ranges from 14 to 16 days. Higher temperatures accelerate the cycle while lower temperatures will extend the parasitic activities. The three day duration of the tomite stage is the only stage in which the parasite is vulnerable and can be treated with medication. This limited vulnerability explains why it is necessary to repeat the treatment to assure that all parasites have been eliminated. Not completing the treatment due to no reoccurring symptoms (white spots, etc.) usually leads to a renewed outbreak as the parasite is in its burrowing and re-production stage at which the medication has no effect. Left untreated, about 15% of the released tomites will find and occupy a new host. This rather small number nevertheless accumulates to a 10 fold increase of parasites per week. All fish are vulnerable and pose as potential hosts. Some species are more, some are less susceptible, depending on the slime coat and overall health of the fish. Ich in nature is very rare and without the problems known in aquariums and closed aquatic systems. Due to the close confinement, Ich exploits the conditions of captivity in which it can easily spread. Most fish have a particular nightly resting spot from which the parasite moves off to form the cyst (the cyst building trophonts and the tomites released from them occur at night). Once freed from the cyst the tomites find a host ready in waiting. The quarantine tank or a fish dip is the best preventative measure to avoid introducing the parasites by aninfected newcomer. Once Ich breaks out, the main tank has to be treated. Several treatment options are commercially available and have to be used as directed. Treatments should be chosen based on the set up as active ingredients contain copper, formalin or malachite green by themselves or in combination. These can and will pose significant risks for plants, invertebrates and reef systems. Copper, if overdosed, lowers the fish’s’ resistance to fight off diseases, and can cause damage to liver and kidney. For salinity insensitive aquatic environments, slowly lowering the salinity to 1.009-1.010 (specific gravity) for 14 days will extinct the parasite. For more delicate plant and reef setups, reef safe treatments not containing above compounds have to be used. Please help. I’ve had fish for over 50 years and have treated for ick in the past. I’d like to know if fish can have ick without getting any white spots. I’ve lost quite a number of fish in a 55 that was set up about a year ago. I did see a fish rubbing on the gravel so I treated for ick. That fish I still have but others have died. In some cases ick may be restricted to the fish’s gills, in which case no white spots become visible. You should talk to the staff of a knowledgable fish store asap. They are best equipped to help diagnose and recommend a treatment for the disease. The life cycle of the parasite is 2-3 weeks and without a host Ich will be eliminated after that period. The invested aquarium has to be treated for at least 3 weeks to make sure. I am uncertain on what you refer to as vague descriptions made by the manufacturers especially not being aware on what the claims are. This is best brought up with the manufacturer. Please address this question with the manufacturer of the ich medication. “Ich cysts can lay dormant in the substrate for a long time.” Can they be dormant if they’re boiled? Or bleached? My concern is the Filter bags that hold charcole as well as the filters themselves. Both, boiling and/or bleaching should kill any existing ich cysts. If you decide to use bleach, be sure to thoroughly rinse off all bleach. Introducing bleach into the aquarium can have very bad consequences. My porcupine puffer had ich and he infected another fish, the little fish didn’t make it and we think the puffer ate it and we think he got sick again, is that posible? He were treating the water ones we saw he was acting strange and he was getting better till that little fish disappeared and later we seen he was dead and the puffer sick , he died today. So is it possible the puffer got sick again from eating a fish with ich? Ich is not really an internal parasite and is not transferred by eating, but free floating tomites that look for a host. The characteristically white granules on the outside of the fish is a stage preceding the tomites. So in essence, a fish cannot get ich by eating a fish that has ich. I have a picture of my fish, can you tell me if he has ick or not? Check with Google images to see pictures of ich. This should help you determine if you fish has ich or not. So what could we do to treat ich? Please answer, my pleco is suffering! Also, my pleco with ich is breathing heavily, so I cycled the tank. Is that a good idea? Adding on to my first comment, (sorry if I posted too much) my pleco is the only one in the tank. I thought he’d be okay because he was agressive to my other fish. What should I do? You should visit your local fish store asap. They will be able to recommend a treatment option for you. Ich should be treated as soon as it’s detected. We usually use a product called ‘Kick Ich’ by Ruby Reef and have had good success with it. As far as cycling the tank, I’m not sure what you mean by that. The tank should be already cycled after initial setup. Hi! What I meant was that Spots (my pleco) is the only one in the tank. So are you suggesting that I should get another tank mate for him? Won’t the ich spread? I thought that if my pleco was alone in a tank, he’d be better off, and wont be stressed like he was before. I am very confused. No, you should not add new fish to the tank while you are dealing with disease. I don’t know where you think I suggest that. Unlikely. Ich cysts can lay dormant in the substrate for a long time. I had snails in an ich infected tank and my partner made the mistake of putting them in my other established tank of pictus catfish. Could my snails pass down ich to my other established tank? Snails do not carry or transfer ich. However, any water moved along with the snails from the infected tank can contain the parasite. Yes, Ick is highly contagious and will spread from fish to fish. Infected fish should be immediately removed from the aquarium and treated in a quarantine tank. Please contact the maker of Super Ick for questions specific to their products. I have lost every single fish in my tank, evidently to ick, however, my algae eater and 2 Cory catfish don’t seem affected. Is this normal? (I believe that the parasite was introduced when I added fish, since it happened within a week or two of adding them.) Any suggestions? Ick is a disease that will effect any fish in the aquarium equally. Have you medicated the aquarium, if so, you might have just saved those fish from being infected. If you haven’t treated your aquarium, please do so immediately. Can snails introduce ich into an aquarium? My beautiful blue spotted Cichlid of the Dempsey family just got ick…treated with Tetra Ick Guard x 2 days now n it is worse..behavior change B4 spot appeared..Sparkles started hiding..then I did a 25% water change n tested water…ammonia a little high n treated…now ok…what do I do? Get new med? Will it be n his tank forever? Do I turn up the heat..n to what? The only thing ever put n his tank was a snail…the snail died n was promptly removed…please advise..
That’s a difficult question to answer. Ick is a serious illness and has to be treated fast and with diligence to fight it. Any fish that hasn’t been too severely affected should be able to recover if the treatment is working. You should contact the products manufacturer, they should be able to give you better advice on proper treatment and what other steps you may be able to take to stay on top of this. Best wishes for a successful treatment of your aquarium!